I’ve been on kind of a salad kick lately hence the potato salad post earlier this week. Also, Betsy and I have been trying to find a good substitute to a deli sandwich for lunch and honestly, this quinoa salad fits the bill pretty nicely. It’s very flavorful and packed with filling ingredients. I’ve made this salad a few different ways. Betsy’s favorite version was actually with butternut squash, but I’ve made a version with acorn squash and sweet potatoes. The version I photographed for this post was the sweet potato version. 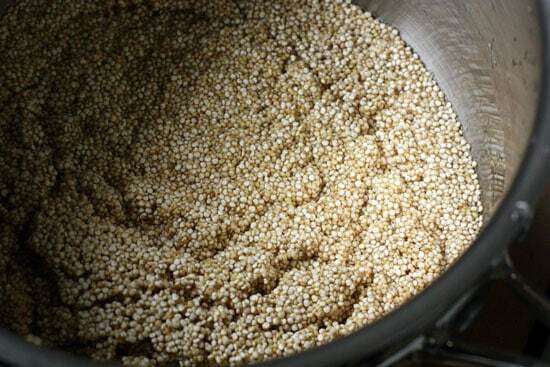 Quinoa, if you’ve never used it before, is an awesome grain. It’s packed with fiber and protein so it’s a great food if you’re vegetarian. It also happens to be delicious so even carnivores shouldn’t be afraid of the stuff. I’ve used it a few times on Macheesmo before, but this is by far the most quinoa-packed thing I’ve made. A great cold salad with quinoa, sweet potatoes, cranberries, and pumpkin seeds. Great for lunch or as a side for a BBQ. 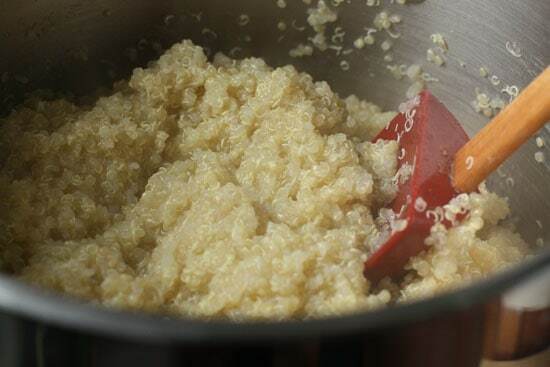 1) Rinse Quinoa with cold water to remove dirt. 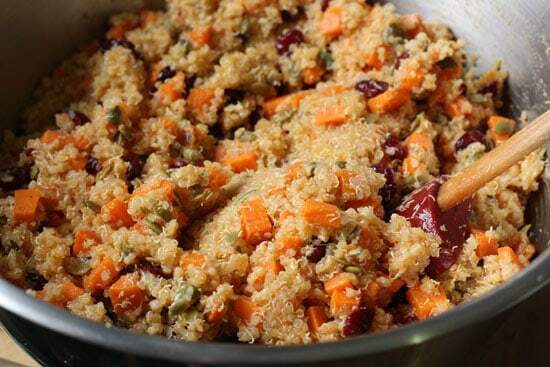 Drain the quinoa and add it to a pot with 2 cups water for every 1 cup quinoa. Bring to a simmer and simmer, covered, for 10 minutes. Be sure to check your cooking instructions on your quinoa as cooking times might vary a bit. 2) Poke a few holes in the sweet potatoes with a fork and bake them at 350 degrees for 50-60 minutes until they are tender. Let the potatoes cool for a few minutes when they come out and then peel and dice them. 3) Mix cubed potatoes in with quinoa. 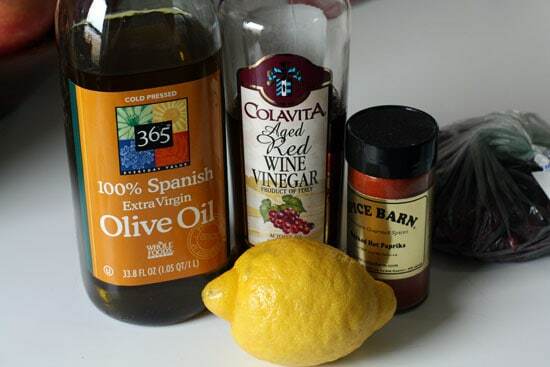 4) For dressing, whisk olive oil, red wine vinegar, lemon juice, honey, and paprika together. Season with a pinch of salt and pepper and pour it over your quinoa. Go light on the dressing. You might not need all of it. 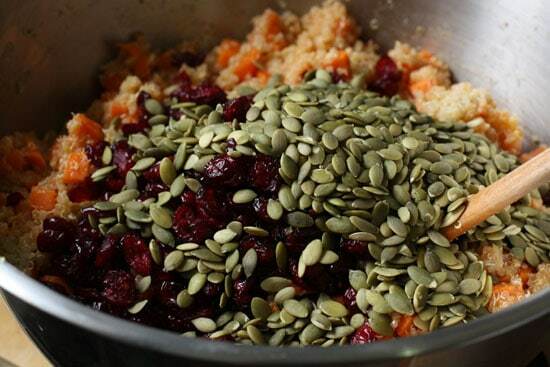 5) Stir in cranberries and pumpkin seeds. 6) Taste for salt and pepper and store in the fridge for up to a week. Quinoa is like any grain really. 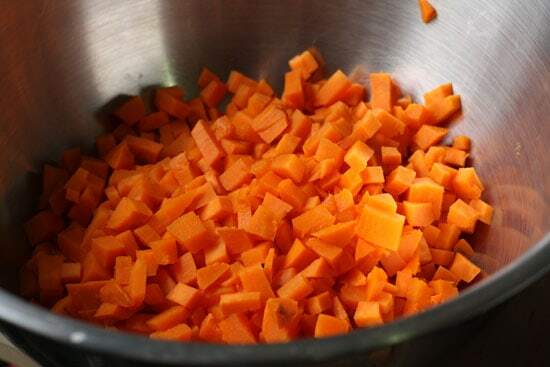 To cook it, just soak it for a few minutes in a bowl of cold water to remove any dirt. You don’t need to soak it overnight or anything. 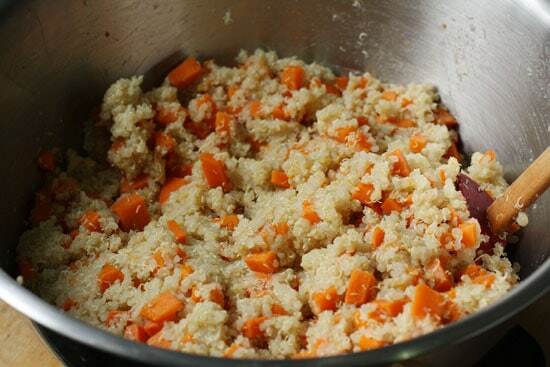 Next, add the quinoa to a large pot with cold water at a ratio of 2 cups water to 1 cup quinoa. Simmer on low heat, covered, for about 10 minutes until the water is absorbed and the quinoa has turned translucent. That’s how you know it’s done! Also it’ll be tender and tasty! Unlike some previous sweet potato experiments I’ve embarked on, for this salad the potatoes are pretty simple. 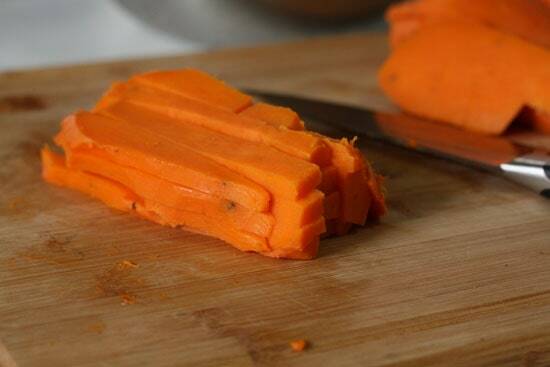 First, stick your sweet potatoes on a baking sheet and poke a few holes in them with a fork. Bake them at 350 degrees for about 50-60 minutes until they’re very tender. By the way this is the same process I used for both the butternut squash and the acorn squash. Just chop them in half, poke some holes in the skin, and bake them for 50-60 minutes. Let your potatoes cool for a few minutes after they come out of the oven and then peel and slice them into about 1/2 inch strips. Then cube them into even cubes! Each one of these should be pretty tender, but not mushy at all. Next, just mix your potatoes or squash with your cooked quinoa! I didn’t want a heavy dressing for this salad, but I felt like it needed something to add some flavor to it. The recipe I gave above is a pretty good start I think, but feel free to experiment. I just whisked all my ingredients together and then poured it over the quinoa and potato mixture. Stir everything together to make sure the grains and potatoes are evenly covered. Go light on the dressing people. You don’t want pools of dressing at the bottom of the bowl. Next, add your dried fruit and pumpkin seeds. Of course, you could add any dried fruit that you wanted (cherries, chopped mango, etc.) and any seeds as well (sunflower?). It’s as simple as pouring stuff into a bowl. Stir it all together and definitely taste it for salt and pepper. My versions always needed a big pinch of both. The salad is good warm or cold and keeps in the fridge for about a week. This is a really healthy salad. Every time I brought it in for lunch, I felt like I had lots of energy in the afternoon which is always helpful. Not to mention that it’s really a cinch to make. Leave a comment! Do you know of any other variations that would work with this?! Where do you buy pumpkin seeds? I bought these at Whole Foods, but you could sub your seed or choice or as Lisa suggests, if you use the squash, you can just roast the seeds and salt them lightly and use those! The other night I found myself with the dregs of a box of quinoa and a half cup of wild rice… they have about the same cooking time (according to the boxes of both) so I cooked them together. It was pretty tasty, and they have slightly different textures which was interesting. I have mixed together quinoa and millet for the same reason. I actually prepare them both together in my rice steamer, using a vegetable stock as the liquid. Very nice & very easy! This ended up being a beautiful dish. I have seen boxed of Quinoa at The Fresh Market, but have never tried it. I'm thinking some kind of mixture with sun dried tomatoes in it sounds wonderful! You inspired me, Nick. I just mixed up some quinoa with chopped red bell pepper, cucumber, spring onions, avocado, feta (figured we needed a little protein), and a vinaigrette with my beloved Aleppo pepper. mmmm. Nice one, I bought some quinoa a few weeks back, intending to make it for breakfast a la porridge, now that it's getting towards winter over here, but I'll def have to try something like this. Just made this, eating it now. It is soooo good & super easy. Thanks for the recipe!! I was looking for a suitable recipe for my new braces on, and it was super easy to make and very delicious and nutritious for my vegetarian diet. I steamed the vegetables (added potato and zucchini) first and then roasted for about 10 minutes only, it still turned out a perfect salad – nice and soft for my braces!!! I know I’m late to the party on this one, but this was FANTASTIC (even better the day after). The cranberries were an excellent addition, giving it that extra pop of flavor in every bite. So, I’m late finding this recipe, and just made a TON. More than I need or can eat within a week. Does anyone know or have any ideas on how well this would freeze? I think it would freeze okay… not great… but okay. Make sure that it’s completely cool before freezing it and let it slowly thaw when you’re ready to use it. Good luck! 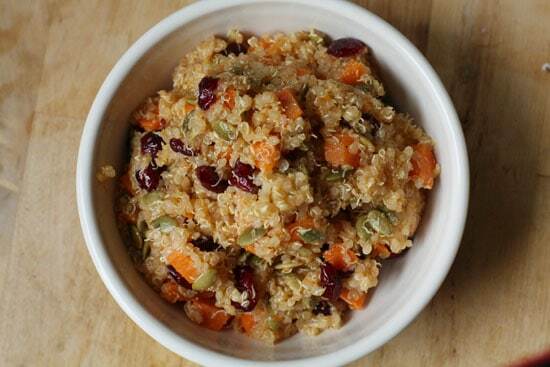 This looks delicious and I have eaten lots of quinoa before. I like to use seasonal ingredients so I will share my spring/ summer quinoa favorite. Cook quinoa with water in 1 to ratio. Remove uncooked kernels of fresh corn, scape down the cob and also chop fresh scallion. Add to the pot of cooked quinoa and put the lid back on, it will cook the corn just till crunch and slightly wilt the scallions. 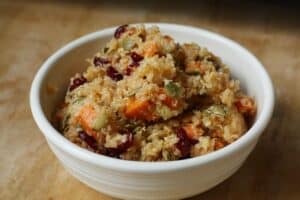 when cooled remove lid and add dried cranberries and crumbled feta, top with you favorite dressing ~ I like balsamic for the sweetness, but any you like will do, be creative with the fruits and cheese, just be sure the quinoa is cooled or the cheese will melt.